What are the ethical responsibilities of a filmmaker dramatizing current events? I don’t have an answer, but HBO’s new film, Brexit, is a decent occasion to ponder the matter, as it very much dramatizes current events—it’s airing in slightly spooky concert with a certain significant vote (lest we in the U.S. imagine we’re the only ones dealing with government dysfunction). I screened this film in almost total synchrony with the landslide vote against Theresa May’s redheaded stepchild of a Brexit deal. It was eerie, to say the least. In fact, that question—what are the ethical responsibilities in making a film like this—is probably more interesting than the film itself. 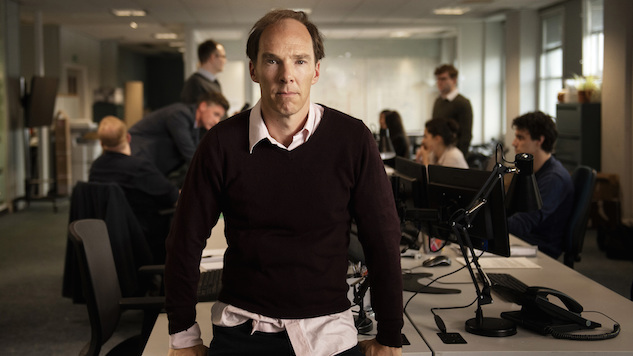 I speak as a person with a borderline-abnormal appetite for the terminally posh Benedict Cumberbatch, who does turn in an excellent performance as behind-the-scenes political influencer Dominic Cummings. But in spite of his chops and those of playwright James Graham, Brexit falls short of being entirely captivating. It’s patently biased, in a way that doesn’t especially gratify even people like me who more or less share the writer’s opinion on the referendum. Its characters aren’t especially exciting (Cummings is one of the few who’s presented as even remotely three-dimensional) and the direction is competent but not knockout-grade. What this film does stand to do is spark thought and debate and discussion about (at a shallow level) the U.K.’s attempt to excuse itself from the European Union and (to a far greater degree) things like nationalism and tolerance and the nature of political influence. At which point the question of ethics really does come into fairly sharp relief. Sane people can have widely varied opinions on what obligations exist for a storyteller who’s chosen to portray non-fictional people and events. How great an obligation do we have to be “realistic” or “truthful” or “fair” to actual people and situations? There’s a case to be made for “none,” to be sure, but I think that answer can be a little facile. In this case, we have a film about an event in very recent (indeed, real-time) world politics that happens to center on the decision to manipulate voters’ perceptions. When a film promises “the real story behind” something like the Brexit referendum, there’s a certain expectation related to the concept of “real.” And, arguably, it’s irresponsible even to release a film that purports to tell the “real” story while the real real story is still unfolding, because no storyteller will ever achieve complete neutrality or a genuinely dispassionate and balanced perspective. In Brexit, for example, the filmmaker and writer are clearly on the other side of the political fence from the characters they’ve brought to the screen. By portraying the masterminds of the “Leave” campaign as egotistical sots, or as cravenly manipulative bastards, or as fearmongering bigots (and they certainly do ring all of those bells), might they not have a potentially unfair influence on the ongoing dialogue about the U.K.’s future? There is a no confidence vote on the floor of Parliament as I write this sentence, so I’m going to go ahead and suggest that, for good or bad, that potential influence is very real. If a guileless, gullible moviegoer (someone like the Regular Joe British citizens in the film’s focus group scenes—reactive, resentful, not overly educated) were to see this film and take it as gospel truth, it might leave that viewer with the distinct impression that the majority vote to leave the EU was… bogus. Ill-gotten. A sham. Depending on which side of the issues one is on, one might see that as a blessing or a serious political problem. One might make a decent case for the film as a needed breath of fresh air… or, as still more agit-prop. Does Brexit offer a fair, realistic portrayal of the 2016 referendum and the people who made it happen? Luckily, that’s beyond my purview here, because I don’t really know. I have been reasonably aware of the campaign and of course aware of the result (as the film’s tagline says, “Everyone knows what happened. Not many know how.”), but I wasn’t paying an inordinate amount of attention to the characters involved, and I certainly wasn’t lurking in the shadows twiddling my evil-genius moustache and looking to sway the vote. Apparently that was what Dominic Cummings was up to as the head of the official “Leave” campaign. And apparently the U.K. crossed the same Rubicon the U.S. did around that time, by hiring next-level data miners. There are vocal demands for an investigation into the “Leave” campaign, which has already been found guilty of illegal use of funds, even before there has been an investigation into its use of Cambridge Analytica and its Canadian cousin, Aggregate IQ, to whom the campaign paid some £2.7 million. The stalemated Brexit plan continues to dominate headlines, and now there’s a movie about it starring a guy who’s recently played the world’s greatest sociopath detective and an egomaniacal master of the mystic arts. It’s not hard to see why the movie’s controversial, or why most of the coverage of it to date is about its context rather than its artistic merits. Where does that leave us? Reviewer Me says it’s entertaining, Cumberbatch is great, the script is pretty good. Philosopher Me still has a lot of questions. Brexit premieres Saturday, Jan. 19 at 9 p.m. on HBO.